Whatever happened to the loco that stared in 'Brief Encounter'? I first saw 'Brief Encounter' on black and white television in the early 1960s. It wouldn't normally have appealed to me as a 10-year old boy, but it opened with an obviously LMS steam loco racing through a mainline station. It dragged in parts with shots of two people having a rather stylised conversation in a station buffet, or a middle class family sitting around the fireside, but just once in a while a train would steam into view. One scene I did recall graphically was of a Stanier 4MT tank with LMS on its tank chuffing away with a suburban train. At the time the number did not register. 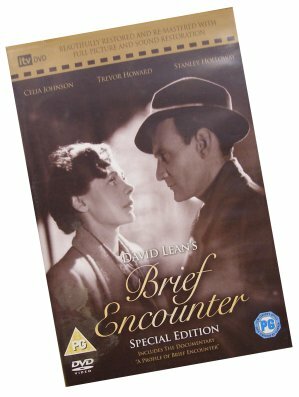 For most people 'Brief Encounter' is a 1945 British classic film - according to Wikipaedia - directed by David Lean about the conventions of British suburban life, centring on a housewife for whom real love (as opposed to the polite arrangement of her marriage) brings unexpectedly violent emotions. The film stars Celia Johnson, Trevor Howard, Stanley Holloway and Joyce Carey. In 1964 I attended an auction organised by British Railways at Chapel Street Station with my father, sister and future brother-in-law. We put bids in, and along the way collected some odd items: a large wooden (and heavy) Gentleman's sign; a ticket rack; a sign from the Midland & Great Northern Railway advising people not to cross the line....and a locomotive number plate off 42429. It was many years before the significance of the loco's number struck me. 2429 (as she appeared in the film) was a Cumbrian Coast loco, being shedded at Carnforth. In due course she passed into BR ownership and became 42429. I have only seen two published photos of the loco, one at Whitehaven in the bay platform with a train for Carlisle and the other of her running into Bury Knowsley Street, having just come down the chord from Bury South and Trinity Street. In due course she moved from Cumbria and was latterly working from Gorton shed, where she was withdrawn. Gorton Works was her final destination, and here she is on 2 February 1962 - possibly the last time the numberplate was photographed in situ? 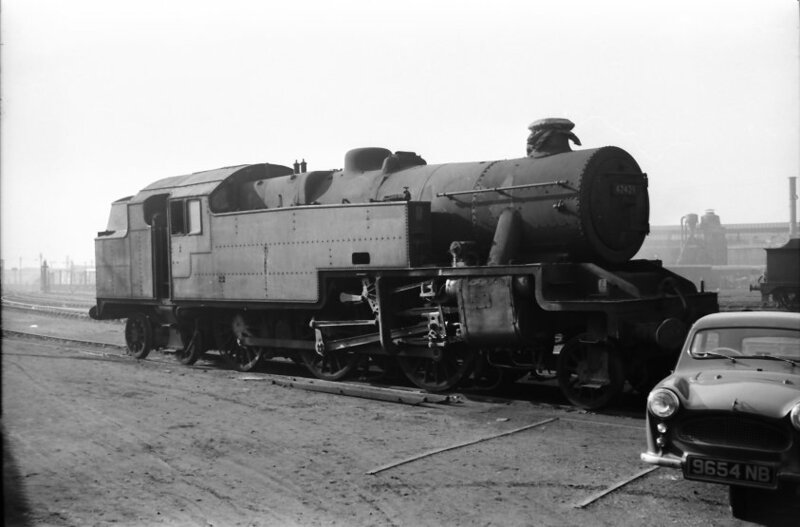 ...and here she is on 15 February 1963 in the company of Deeley 3F 0-6-0 43789, which had been withdrawn in June 1962. 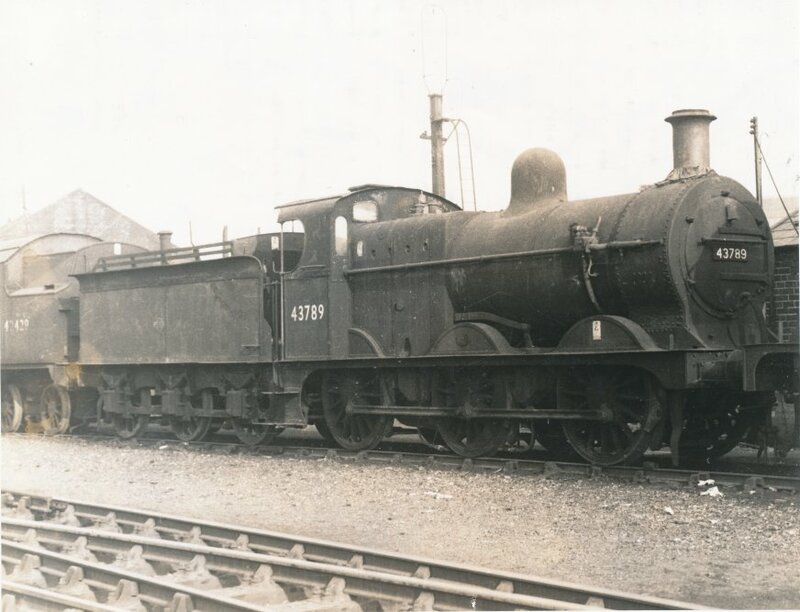 The withdrawal date given on the back of the photo for 42429 is October 1962. J K Wallace collection; This photograph is reproduced in good faith, having taken all possible steps to identify the copyright owners. Should an infringement have occurred we offer our apologies, and invite the copyright owners to make contact at the address below. She was first photographed in store - with her numberplate still attached - at Gorton Works on 22 February 1962. Finally, her numberplate was removed, and along with much other material gathered up from the Manchester area, deposited at Southport Chapel Street station for a BR-sponsored auction held in the old Refreshment Rooms - probably the last time the public were admitted to the rooms. And the numberplate has lived in my loft ever since! It only seems right and proper that there should be an opportunity for 'Brief Encounter' to be viewed and the YouTube clip is here. However, train buffs beware: the material of greatest interest (i.e. railway interest) - including 2429's brief spell in the limelight - is fleeting. 2429's moment of stardom is at 19 minutes 37 seconds. Remarkably, the 1964 auction at Southport Chapel Street hasn't gone unrecorded either, as there is also a film of the day on YouTube as well. This shows the auctioneer doing his stuff on Platforms 9 & 10, where the larger lots where located, together with people leaving with their acquisitions. 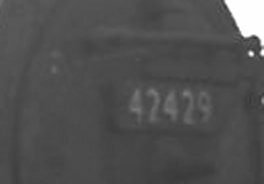 There are no known film clips of 42429 (unless you know better!). And if anyone has other photos of 42429, please get in touch.